Laurent Achard and his crew chose to converse with Jean Claude Brisseau at home in his book-littered dining room, in a free-rolling reminiscence of his early passion for film theatres, his cinematographic tastes and disap­pointments, his aspirations and rebellions. When Laurent Achard suggests filming him for Cinéma de notre temps, Jean-Claude Brisseau marks out a precise territory, one that is his own: his flat and his words. Because he is one of those directors who bring the cinema into their homes – he films and edits at home, has built a film theatre there with thousands of films on all types of media. One of those directors who talk about cinema at any hour of the day, in any circumstance. 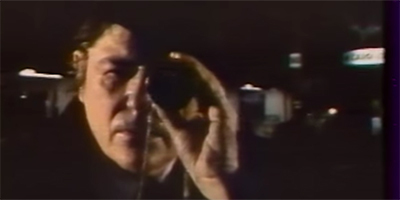 Settling down “chez Brisseau”, how can one avoid the interview format, stay on this territory yet create another space, a sort of enclave, and a time other than that of Brisseau’s discourse? 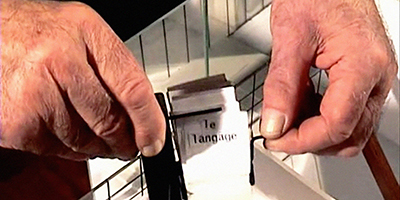 Laurent Achard invents a device whereby the spoken word is but one of the components of this conversational film: time is suspended, phantoms cross paths, glasses dance in a burlesque ballet, cats sneak in and out of the frame, cinema is found in unexpected places and suddenly the house contains the world, the set encompasses a backstage, the unity of place and time multiplies viewpoints and Achard paints an amusing and subtle portrait of a filmmaker of our times, Jean-Claude Brisseau.